Although the American Academy Of Pediatrics frowns on television for children before the age of 2, by around 3 or so, parents are given the go-ahead. By this time, said parents are likely desperate for a blissful 30-minute break just so they can get dinner started, unload the dishwasher, perhaps chug a glass of wine in the kitchen. To get there, it’s time to delve into overwhelming, vividly colored world of kids’ TV. Once your youngster finally gets old enough to watch television, they’ll pretty much look at anything. TV is bright and shiny, and they have literally no idea what they’re viewing. So it’s up to you, the dedicated grown-up, to wade through the seemingly endless flood of broadcast output from Sprout, PBS Kids, Nick Jr., and various Disney channels. But how can you make sure what your kid is watching isn’t just a giant toy commercial? How can you maximize learning potential at this age? (Stick with the sciences, babies: The humanities are for suckers!) How can you make sure you won’t run right into the dreaded Dora The Explorer without warning? For the uninitiated parent, The A.V. Club is offering a four-week guide to some kids’ shows that won’t make you want to weep until your tyke is finally old enough to join you for decent family-watches like The Flash or River Monsters. In short, we’ve watched Lalaloopsy and Pokémon so you don’t have to, and we’re even adding accompanying reading material where available. We’re kicking off this week with shows for the pre-K set. Next week: K-1st grade. Week three: 2nd-3rd grade. In week four, we’ll list five kids’ shows to avoid at all costs. And yes, Barney will be on that list. Sesame Street is the gold standard for a reason. At this point we can all pray that it never goes off the air, so that future generations won’t have to contemplate a Cookie Monster-less life. Even in its fifth decade, the series stays fresh by offering takes on modern TV shows like Mad Men and Game Of Thrones, with guest appearances from current stars like Benedict Cumberbatch, Zach Galifianakis, and Elvis Costello (singing “The Monster Went And Ate My Red 2”). Don’t be surprised if you’re compelled to sit down and watch with your kids, and you may be rewarded with a fun counting video from your own childhood. A word about Elmo: Yes, on his own, Elmo is frightening and annoying. 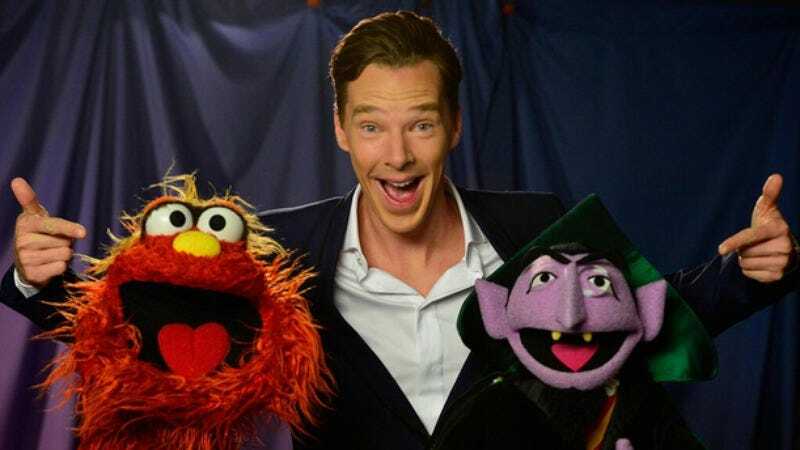 But he’s probably going to be your toddler’s favorite Muppet; just accept it. Elmo’s World has been replaced by the math-focused Elmo The Musical, which shows up 15 minutes before the end of the show, in case you want to start your kid out in small TV doses. On his own, Elmo’s not so bad. Keep in mind, though, that various Elmo toys (like the dreaded Chicken-Dance Elmo) have been known to terrify small children at Christmas. Suggested reading: You can find a metric ton of great Sesame Street publications, but the Grover classic The Monster At the End Of This Book is now available in pop-up format. Availability: Running on PBS, now and forever. This warm, wonderful show, based on a lovely series of books written by Else Holmelund Minarik and illustrated by Maurice Sendak (creator of Where The Wild Things Are) is the perfect entry for your child’s first TV favorite. Little Bear lives with his parents and some other animal friends in a sunny forest, backed by a soothing classical score (mostly violin and piano). He fantasizes about trips to the moon and ocean battles, but always comes back to Mother and Father Bear in a series of three stories per half-hour, featuring gentle morals that never lecture. Parents have been known to be more reluctant to give this show up than the kids are. Suggested reading: Follow up with Else Holmelund Minarik’s books: Little Bear, Father Bear Comes Home, Little Bear’s Friend, Little Bear’s Visit, and A Kiss For Little Bear. Availability: Nick Jr. and YouTube. Blue’s Clues is one of those shows that appears truly hideous from an adult viewpoint. Then when you sit down with your kid, you kind of get it, although each episode’s audience-participation mystery might be disturbing for parents who don’t want to see their kid talk back to the TV. But you may also bless Blue’s Clues for its quietness; there are no insane soundtracks here, and the songs are mercifully short. This is a Mystery Science Theater situation, however, wherein you should only go for the episodes featuring Steve as a host (sorry, replacement host Joe). More than the crazy green-board animation, it’s Steve who really makes the show, as he leads kids through fun mysteries with an unflappable, non-condescending delivery, and always tells them how smart they are. When he left, a lot of the show’s charm went with him. Availability: Nick Jr., Vimeo, and Amazon Prime. Based on Rosemary Wells’ series of books, Max & Ruby features a young rabbit and her even younger brother on a series of misadventures. Their setup is a bit suspect (Where are their parents? Why do they only visit Grandma, but not live with her? ), but this charming series lets most of these logical questions fall be the wayside. Max usually thwarts Ruby’s plans somehow, but ultimately saves the day in the end. Along the way, kids learn counting (“Bunny Party”), simple math (“Bunny Money”) and memorizing lists (“Bunny Cakes). We have another casting issue here, however, as the earlier episodes where Samantha Morton voices Ruby are infinitely better than the ones that followed. Suggested reading: Start out with the book versions of the episodes mentioned above: Bunny Cakes, Bunny Party, and Bunny Money. The five strange beings that make up The Backyardigans (Tyrone the moose, Tasha the hippo, Pablo the penguin, Austin is apparently a baby kangaroo, and no one is sure what Uniqua is) depart from that backyard into awesome adventures every half-hour episode. Not only does this give kids great ideas for their own playdates, Backyardigans sneakily throws in several catchy songs and different dance genres like flamenco, swing, and tango. Instead of using adult voice actors, a young voice cast puts over every preposterous plot, from a sea-monster diving adventure to a trip to Mount Olympus. Wonder Pets! features a trio of schoolroom pets—guinea pig, turtle, and chick—who go off and save baby animals in two separate adventures every episode. Your child will be soothed by the formulaic setup, but will also appreciate the slight differences: In the beginning of every episode, there are clues in the classroom indicating where the pets will be traveling, as well as a conundrum among the three friends that hints at how they will be able to save the animal in question. The pets push teamwork, and sing and rhyme so much that each episode resembles a mini-musical. They also encourage travel, as each baby animal is tied to a specific place: a baby gecko in Costa Rica, a baby pigeon in New York City. Even the baby pigeon is cute, like all the baby animals, but never cloying. Dinosaur Train is a no-brainer: If there’s one thing kids love more than trains, it’s dinosaurs. One of The Jim Henson Company’s first CGI efforts, Dinosaur Train offers two train trips per half-hour episode. Each story works in various facts about different dinosaur types and eras while also offering an adoption allegory with its setup of a Tyrannosaurus being raised with a Pteranodon family. Paleontologist Dr. Scott offers extra info at the end of each episode, so that kids can see how creatures like the Deinosuchus preceded today’s crocodiles. Yes, it’s fortunate that the carnivorous T. rex doesn’t eat his brethren, but it’s also unlikely that the Dinosaur Train can travel through the Mesozoic Era, or really, that there’s a Dinosaur Train at all, so best just to go with it. And since so many elements of pop culture just offer dinosaurs as terrifying predators (Jurassic Park), this is a fun way for kids to learn about them in a much more benign environment. Your youngster may then be much more excited about your next trip to the natural history museum. Availability: PBS Kids and YouTube. Overall, nothing on PBS Kids is going to steer you wrong, like Mister Rogers’ successor Daniel Tiger’s Neighborhood. But The Fred Rogers Company had a specific goal in mind when Peg + Cat first hit screens a few years ago: to get girls interested in math. The delightful Peg constantly has a grid sheet in the background, and cleverly works in math concepts like geometry and division into her weekly adventures, which always involve solving a “big problem!” The scenarios range from medieval knights to space travel to cleaning her room (which is filled with dinosaurs and balls, not just dolls and pink). Peg’s deadpan pals (Cat can be counted on for frequent sardonic instances of “I know, right?”) and some send ups of youth culture (“‘Rockin’ means ‘really good’ in teen talk!”) make sure that parents get a few laughs in as well.